It is common to read, watch, and hear reports of landslides and other types of earth movements on sloping terrain caused by heavy rain. The layperson intuitively thinks of the ground as becoming wetter and “heavier” during rain, thus, somehow it becomes “softer” and prone to fail during rain. This intuition is generally well-justified, but there is more to the story of rain and landslides. After all, some slopes never fail during rain; in fact, most don’t. What this paper does is to present a method that accounts for (1) the rain characteristics (intensity, duration), (2) the physical and hydraulic properties of the slope soil (how resistant it is, how pervious, how steep, and the like), and (3) the form in which runoff moves over a wet slope during rain, to assess the likelihood of sloping ground failing during heavy rain. The value of having this method is that one could tell before rain events occur how likely a slope is to fail if heavy rain were to occur. 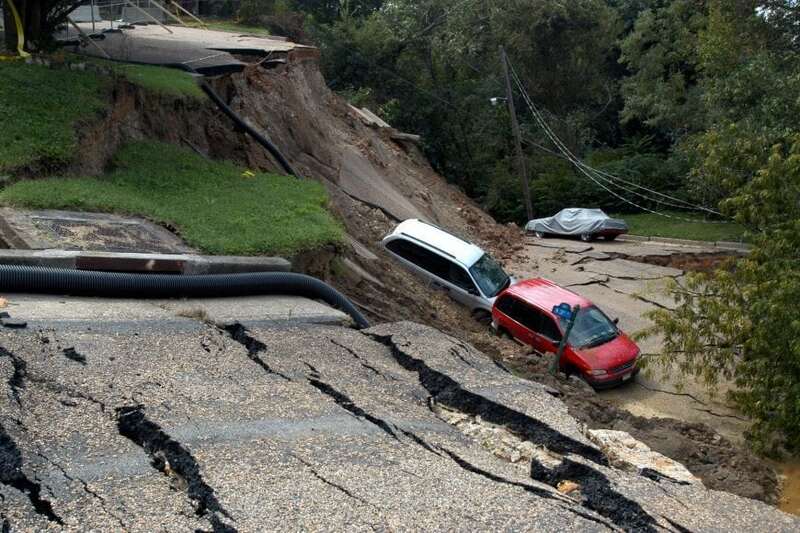 If the threat of failure is high based on the method’s results, then one can take protective measures before a catastrophe occurs, such as draining the slope, reinforcing the slope, moving property away from the likely path of a landslide, or preventing development from occurring on the slope. The method requires basic data cited in items (1), (2), and (3) as input to this paper’s method for slope stability analysis. The data can be gathered from fieldwork and from reviewing rainfall data pertinent to a specific location where sloping ground is found. Once the data are ready one inputs it into the method, which is coded in specialized, public-domain software — that is, we have made the paper’s method available online so the user can run it without having to pay for software. However, collecting the data that goes into the method takes some expenditures, effort, and expertise on the part of the user. The paper’s contents are technical and expressed in a mathematical language understandable to experts on soil hydrology, geotechnical principles, and numerical modeling. The paper presents examples of the paper’s method’s applications, showing what type of rainfall may cause failure of slopes considering what we call “non-cohesive” soil such as sand, and “cohesive” soil such as clay. It turns out that soil type is a primary factor that controls shallow landslides caused by heavy rain. The types of shallow landslides studied in the paper occur primarily on a sloping ground made of non-cohesive soil. The paper also presents a discussion of how heavy rainfall may erode sloping soil, how much of the rain becomes runoff flowing overland and possibly causing flooding, and how much goes into the ground possible causing shallow landslides. These findings are described in the article entitled Infiltration on sloping terrain and its role on runoff generation and slope stability, recently published in the Journal of Hydrology. This work was conducted by Hugo A. Loáiciga and J. Michael Johnson from the University of California, Santa Barbara.